This EASY White Bread is made from scratch. It makes two loaves and is the perfect sandwich bread! 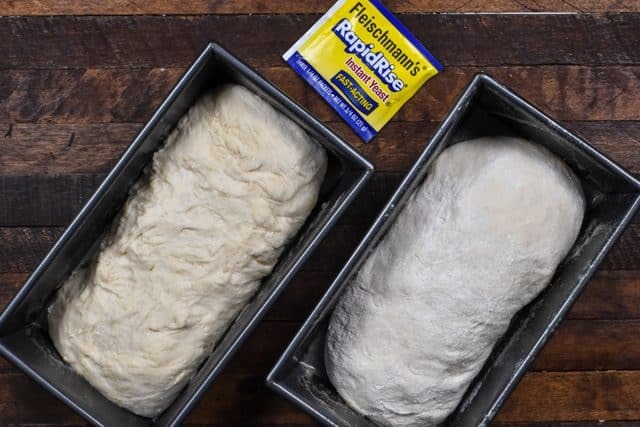 Making homemade bread is easier than you think. 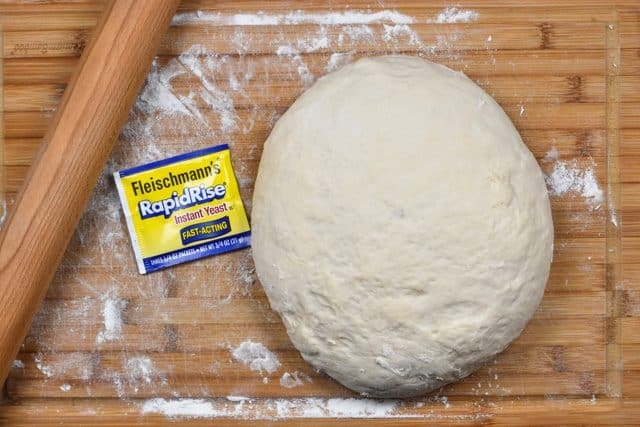 This post is sponsored by Fleischmann’s® Yeast. 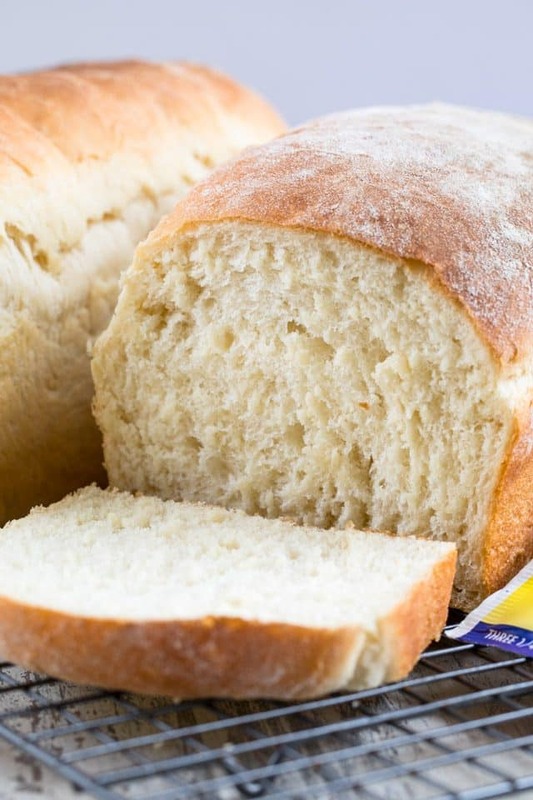 Their RapidRise® Yeast makes making homemade white bread EASY! This year, my goal is to work on sharing baking basics with you; recipes that are those basic everyday ones that we all need in our arsenal. You can see in my baking basics category that I’ve got a few staples, like chocolate chip cookies, yellow cake, and dinner rolls, but I’m going to start working hard to get all the basics checked off the list. The great thing about baking basics is that you can easily turn them into new recipes. Like, take sugar cookies, for example: they can become snickerdoodles. Or, peanut butter cookies can become a peanut butter cookie cake. And, easy white bread can become Cinnamon Swirl Bread! Once you have the basics down you can make hundreds of new recipes from just a handful. Today we’re starting with easy white bread. 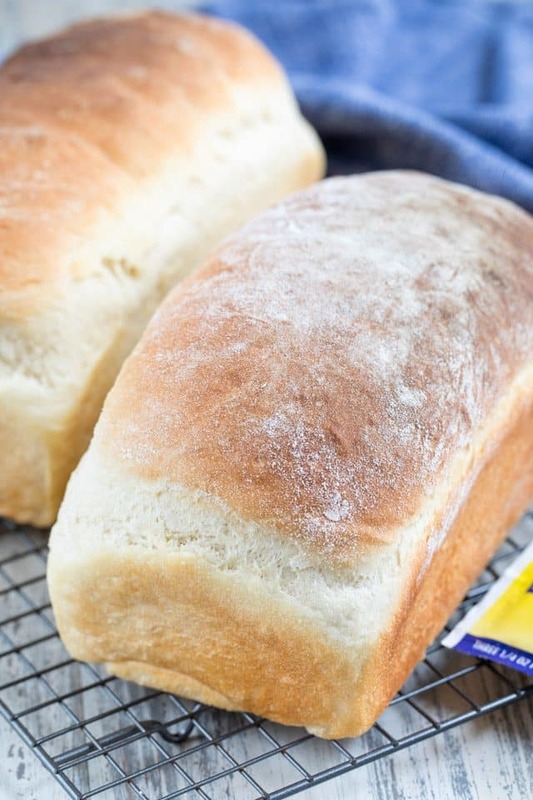 Have you ever made homemade white bread before? I’m new to making my own bread but I absolutely love it. There’s something about making it from scratch that makes you feel like a rockstar. Whether you use this easy white bread recipe for toast or sandwiches, it’s the only recipe you’ll ever need. It’s a basic bread recipe you must have in your baking arsenal! The hardest thing about making homemade bread is not eating it all in one sitting! Warm and fresh from the oven, it’s heaven with or without butter. 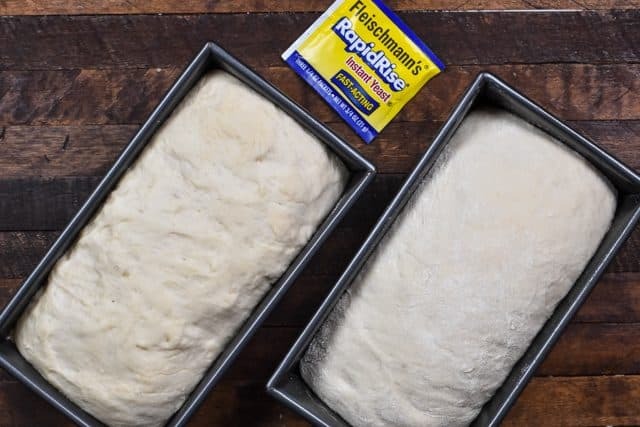 This recipe gives you two loaves of plain white bread that are quick and easy to make, thanks to Fleischmann’s® RapidRise® Yeast. The bread is soft and fluffy with a nice crust and it’s bowl to table in under 2 hours. For a long time, making my own bread scared me because it seemed so daunting and hard. But you know what? It’s not hard at all. It’s almost absurdly easy! Don’t be hesitant to work with yeast. 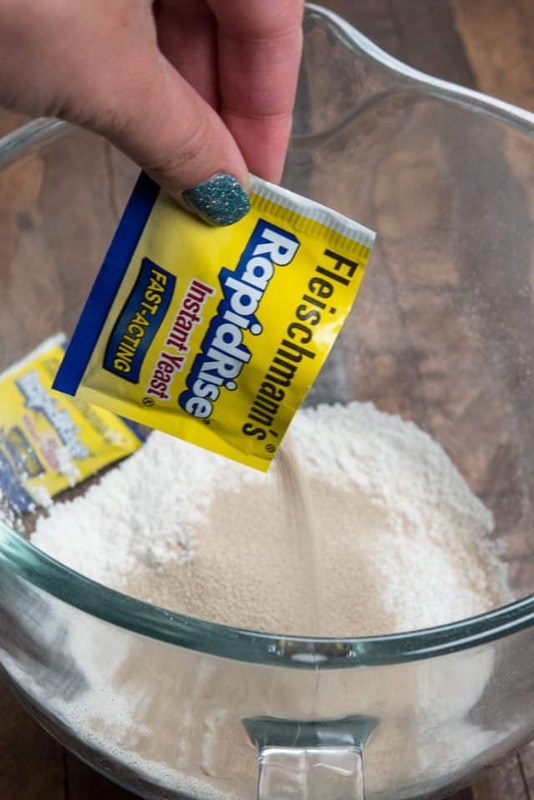 I love using Fleischmann’s® RapidRise Yeast® because it takes a lot of the guesswork out of working with yeast. There’s no waiting for the yeast to proof and the initial rise is only a 10 minute rest, making bread baking simple and it gives me the perfect white bread each time. 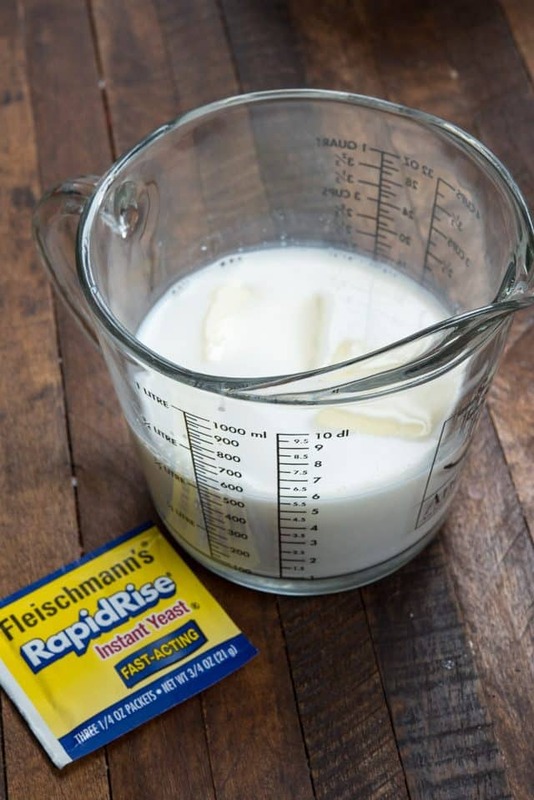 My favorite part about using RapidRise® Yeast is that you add it to the dry ingredients. There’s no need to proof it! Then, simply mix only your wet ingredients together. What substitutions can be made when making bread? The one thing you can’t substitute easily when making white bread is the white flour. You need to use the all purpose flour called for in this recipe; using wheat flour changes the ratios of other ingredients. That’ll be another “basic” recipe I’ll need to share with you. 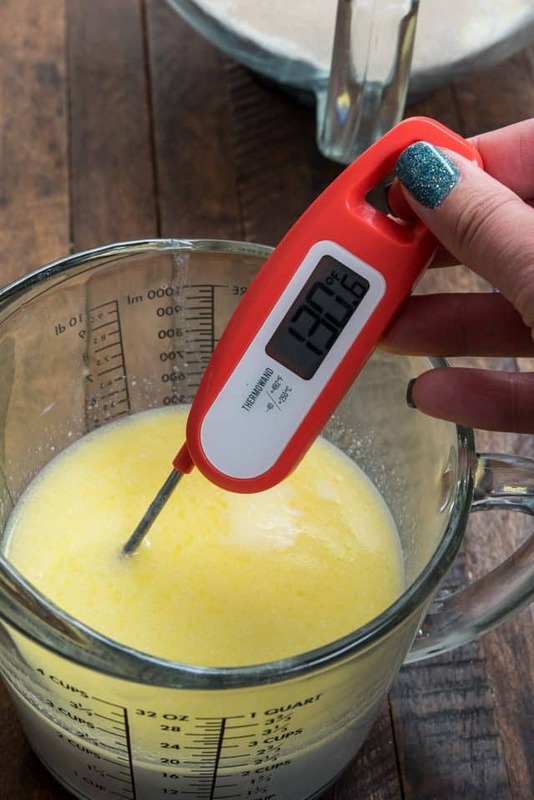 Once you mix the wet ingredients, heat them in the microwave until they’re between 120°-130°F. I highly recommend an instant read thermometer for this step. If you don’t have one, think warm water. 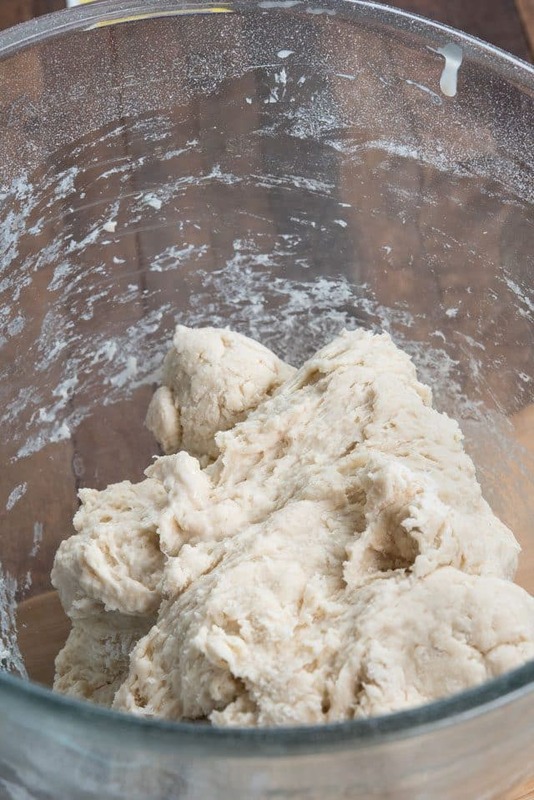 Then mix the wet into the dry and use the dough hook on a stand mixer until the dough forms a ball. How can you make white bread without a mixer? It’s easy, it just takes a bit more work. You’ll have to knead it longer. Once kneaded, it’ll be nice and elastic. At this point, let it rest for 10 minutes. Then, divide it into two equal parts. Then roll each out into a rectangle. Place them in the prepared pans and let them rise for 45 minutes. Then you’ll bake at 400°F for bout 20-30 minutes, or until they’re golden. The hardest part is waiting for them to cool enough to eat! Easy White Bread is the perfect sandwich bread or toast, or even just a snack. It makes two loaves, one to eat and one to freeze or gift. It’s definitely a recipe you need in your baking arsenal! Now that you have the recipe for easy white bread, what other recipes can you make? Raisin Bread – simply add 2 cups of raisins to the bread during the mixing process. Chocolate Hazelnut Swirl Bread – spread 2 tablespoons of chocolate hazelnut spread on each rectangle before rolling up. Roll up and bake as directed. 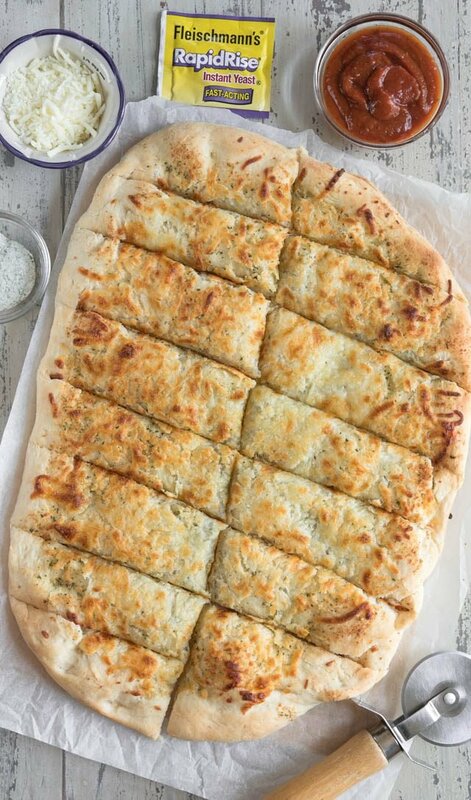 Herb Bread – simply add 2 teaspoons of dried Italian seasoning during the mixing process. Rosemary Bread – substitute olive oil for the butter and add 1 tablespoon of fresh chopped rosemary to the dough while mixing. Also find the Beginner’s White Bread recipe at on Breadworld.com! 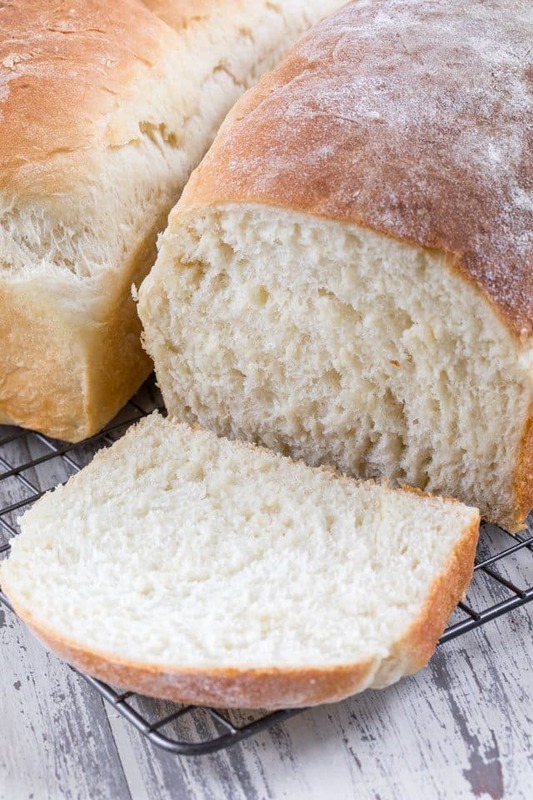 This EASY Homemade White Bread is made from scratch. It makes two loaves and is the perfect sandwich bread! 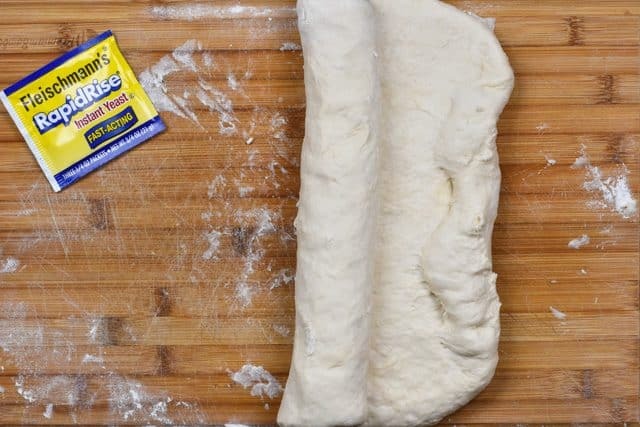 Making homemade bread is easier than you think. Combine 2 cups flour, sugar, dry yeast and salt in the bowl of a stand mixer and stir until blended. Combine water, milk and butter in a microwave-safe bowl. Microwave on HIGH in 15-second increments until very warm but not hot to the touch (120° to 130°F. Butter won’t melt completely). I highly recommend using an instant-read thermometer. Add to flour mixture. Beat 2 minutes at medium speed, scraping bowl occasionally. Add 1 cup flour; beat 2 minutes at high speed, scraping bowl occasionally. Stir in just enough remaining flour so that the dough will form into a ball. 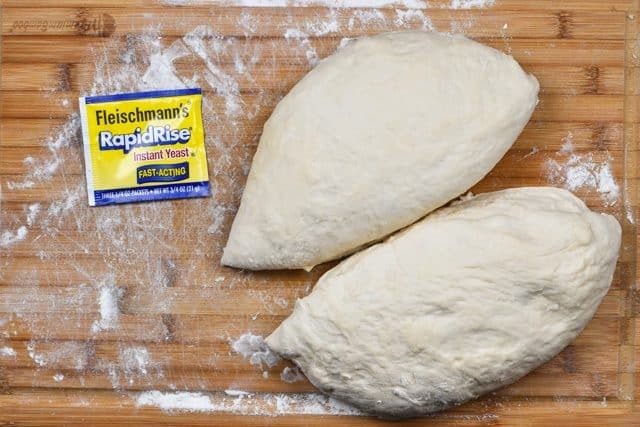 Cut dough into 2 equal pieces. 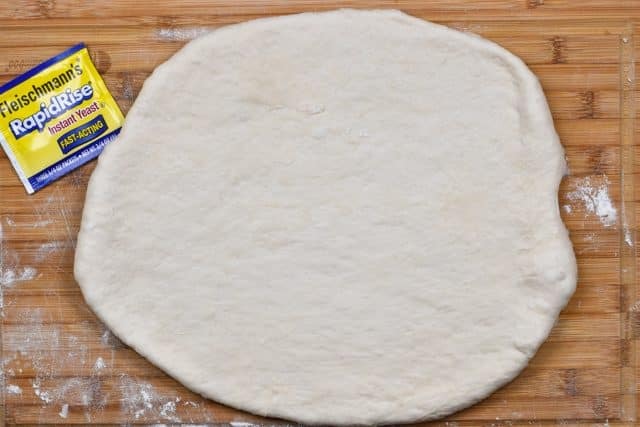 Roll each piece of dough into a 12 x 7-inch rectangle using a rolling pin. Beginning at short end of each rectangle, roll up tightly. Pinch seams and ends to seal. Place, seam sides down, in two 8-1/2 x 4-1/2 inch loaf pans that have been sprayed with nonstick cooking spray. Cover with towel; let rise in warm place until doubled in size, about 45 minutes. Bake in preheated 400ºF oven for 20 to 30 minutes or until golden brown. Remove from pans by running a knife around the edges and invert onto wire rack. All text and images © OnceCoupled for Crazy for Crust. Please do not use my images without prior permission. If you want to republish this recipe, please re-write the recipe in your own words, or link back to this post for the recipe. Disclaimer: Nutrition information shown is not guaranteed to be accurate. Can you freeze the baked bread or will it get weird in the freezer? 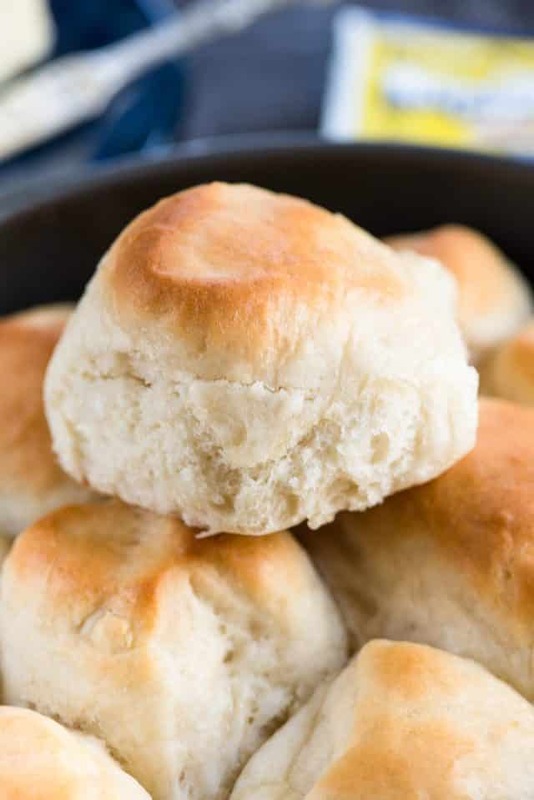 Is there a substitute for the quick rise yeast? If so, does it change the method at all? 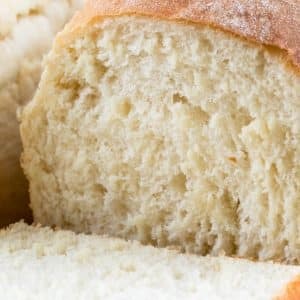 Can you substitute active dry yeast for rapid rise yeast when making bread? Absolutely! You will have to change the rising times though. If your recipe calls for rapid rise and you have active, you’ll have to go at least 1.5 times longer on each rise, but check for volume. If your recipe calls for active and you have rapid rise, cut rising times to about 2/3 what’s called for. Ok, so update– I made this bread this past weekend and it was perfect! While I consider myself a pretty experienced baker, I haven’t ever made yeast bread (always intimidates me!) so I thought I would give this one a shot. So glad I did! I am now hooked on making my own bread! I followed the directions as written and it came out great. I couldn’t find my mixer dough hook so I kneaded it by hand for about 8 minutes. Thanks for sharing this great beginners bread recipe. I loved that it used all purpose and not bread flour! I haven’t baked bread in years and my loaves turned out bakery quality perfect! The recipe was so easy to follow, even someone who has never baked bread before could do this. Absolutely amazing bread, I made this recipe and the 2 loaves as a trade for a Reiki massage, The bread turned out beautiful and fluffy and light. I made this bread and it turned out great. We loved it. A great receipt to go to for homemade bread. Just made this recipe this afternoon and it turned out great! It really is bowl to table in 2 hours-and this was with my 2 year old buzzing around and “helping”.